ATHENS, Ga.— In less than a week, the Georgia Bulldogs have parted ways with Mark Richt as their head coach and now hired his replacement. 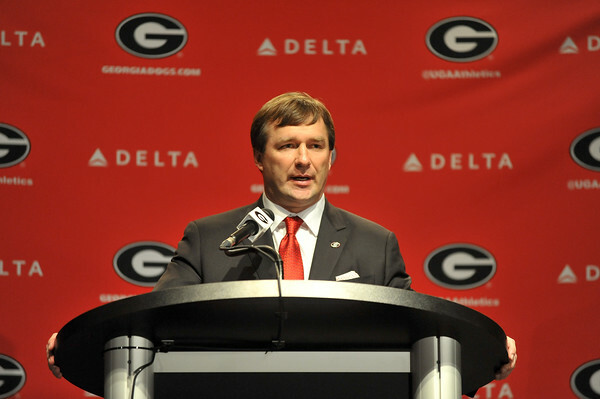 If you’ve been that far out of the loop, his name is Kirby Smart and he comes to Athens after coaching with the Alabama Crimson Tide since 2007. It is a homecoming for the new Georgia coach, after he played for the Bulldogs from 1995-98. He also began his coaching career, as an administrative assistant under then head coach Jim Donnan in 1999. Smart grew up here in Georgia and played high school football for his father Sonny at Bainbridge. He got emotional on Monday in his opening remarks when speaking about his family. Smart also thanked the man who he’s replacing, Mark Richt for giving him a coaching job in 2005. For one season, he served as the Bulldogs running backs coach. The Bulldogs new head coach has learned from one of the best football minds in the history of the game, Nick Saban. He started coaching for him in 2004, as his defensive backs coach for the LSU Tigers. He rejoined him in 2006, to coach the safeties for the Miami Dolphins. He’s been with him ever since. At the Friday coaches press conference for the SEC Championship Game, Saban was asked about Smart and got visibly emotional when describing what Smart means to him. Smart says that Saban has been nothing but supportive of him throughout this entire process. When it comes to the program expectations under Smart, he says they have clearly defined expectations for the players. He emphasized the student part of student-athlete when talking about what will be asked of them. Smart has already met with the team. That visit came on Sunday night. He’s already told them what to expect from he and his coaching staff. The Bulldogs new head coach will be on the recruiting trail for the next week and will return back to Tuscaloosa on Tuesday to help the Crimson Tide prepare for their upcoming College Football Playoff semifinals matchup against the Michigan State Spartans. For those asking about Georgia’s top recruiting target, quarterback Jacob Eason… Smart says he’ll be on the road to visit him immediately. As is usually the case when it comes to being hired for a new job. Smart says tons of people have reached out to him. One of those people is the Falcons current coach Dan Quinn. In terms of hiring the new coaching staff, Smart says there is no timetable on that. His first priority is recruiting. He will be focused on both Georgia and Alabama until his coaching duties at his current job have ended. He says that all coaches will be considered for the openings on his staff. Also, he has not been restricted in any way on who he can hire. Smart did confirm on Monday that he would be with the Crimson Tide until their season is over. Georgia will close out their season on January 2, when they take on Penn State in the Taxpayer Bowl in Jacksonville, Fla.